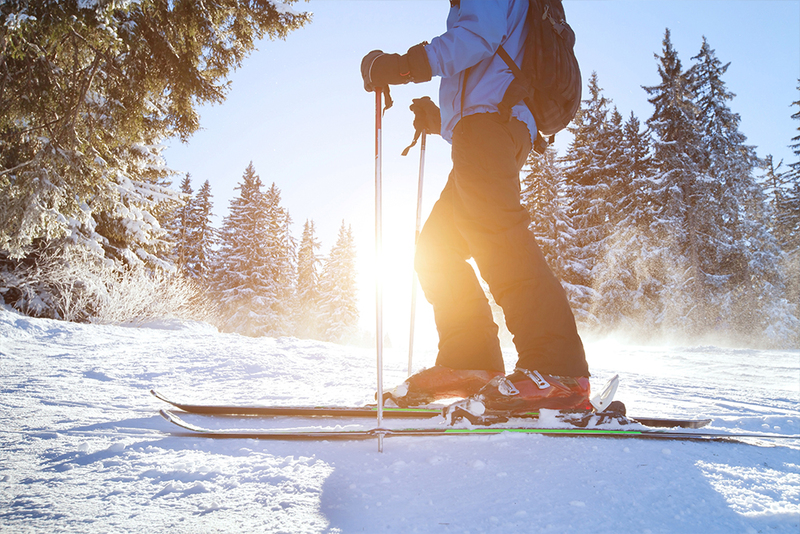 This time of year local orthopedists see a lot of patients with injuries from downhill and cross-country skiing and snowboarding. Some of these injuries can be avoided by exercising a little caution. If you are just learning one of these sports, it’s a good idea to take some lessons so you can learn basic form and safety. Try to resist overdoing it your first time out because too much time on the slopes before you’ve strengthened the affected muscle groups will leave you very sore. And, generally speaking, if you are older than forty remember to take things a little more slowly, especially if you are a first-time snowboarder. I like to caution beginning skiers about ski collisions, which can result in injuries and which occur mainly on the beginner slopes. If you are skiing on a hill marked “green,” you should ski defensively. These slopes are populated with adolescent skiers and beginners of all ages who haven’t yet mastered turning and stopping. If you have stopped on a beginner slope, be sure to look uphill for oncoming skiers who may not be totally in control. One of the most common of injuries in downhill skiers of all skill levels is a sprain of the medial collateral ligament of the knees. This ligament is about three inches long and runs along the inside of the knee. Sprains often occur when the tip of the ski gets caught, twisting the knee. If the sprain is bad enough, it may require a toboggan ride down to the bottom of the hill. Fortunately, this particular injury does not require surgery and typically heals with a temporary brace, ice, and ibuprofen. If you a cross-country beginner, start skiing on level ground and avoid trails with slopes. This is especially important if you do not have prior downhill skiing experience; we see the worst cross-country skiing injuries when people who are not good downhill skiers go downhill on cross-country skis. I also recommend that when first learning to cross-country ski, stick to paths with packed snow. Cross-country skiing on powder snow that is unpacked takes a certain level of skill. You can find yourself in trouble if you are not able to turn and you catch your ski on a sapling. There is an expression among snowboarders called “taking air,” during which they leave the ground either while moving downhill or while moving back and forth between two frozen curved walls. Snowboarders love to “take air” but if you aren’t skilled enough, you can suffer significant injuries to your upper extremities. We’ve treated broken arms, wrists, elbows, hands, and shoulders resulting from snowboarders taking air at high speeds. You can avoid injuries with less air and a lower speed. You should also consider wearing wrist protectors. Among the great attractions of living in the Finger Lakes Region is the opportunity to participate in winter sports. Getting out into the beautiful winter landscape is invigorating and by taking up a winter sport you can increase your strength and agility. However, as with all sports, prudent judgment plays an important role in enjoying your sport and avoiding injuries. However, if you do sustain an injury, there is excellent sports medicine treatment available in this community. Dr. Dirk Dugan is a board-certified orthopedic surgeon and serves on the medical staff of Cayuga Medical Center. He is in practice with Orthopedic Services of Cayuga Medical Associates, where he can be reached at (607)-272-7000. Dr. Dugan has a special interest in sports medicine and is the team physician for the Cornell hockey and football teams.